My name is Max Tepfer. While I’ve worked countless days teaching beginners the basics of everything from walking up snow slopes to scrambling up rocky crags to basic ropework, my depth of experience in bigger and/or more demanding rock terrain has allowed me to specialize in catering to partners seeking a more advanced level of coaching and instruction from their guide. It’s hard to find a guide that can easily put the rope up on 5.12, provide coaching in specialized techniques to increase efficiency on route, or confidently lead pitch after pitch of sustained climbing all day long. This is where I shine. I’ve been climbing in the mountains around the world for well over a decade. While doing so, I’ve become familiar with all styles of climbing, [free, aid, mixed, ice, snow, etc. ], but what guide won’t tell you that? A lot of guides out there get good enough at climbing to show beginners the ropes and then call it good. What sets me apart is my passion for the sport and the fact that I’ve lived and breathed rock climbing for almost a decade. Frankly, the result of that passion is that I’m better at it than most guides and can take you places, teach you things, and challenge you in ways that most other guides aren’t able to. Over the years I’ve gravitated toward performance rock climbing and bigwall free climbing. In addition to repeating numerous classic free climbs across North America, I’ve managed to establish a handful of my own at the 5.12 and 5.13 level. 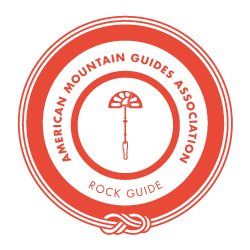 I’m an AMGA Rock and Alpine Guide. This means is that I’ve spent years of my life and tens of thousands of dollars in an effort to better my ability to guide partners through the mountain environment. This entails extensive time spent practicing various ways of managing risk in the mountains and is the highest level of training possible in the disciplines of rock and alpine guiding.